At 2:36am this morning, I turned 32 years old. At 8:30am Rich, my parents and I sat in the doctor's waiting room for the ultrasound to show whether we were having a boy or a girl (as well as some other boring medical stuff they measured about blood vessels). 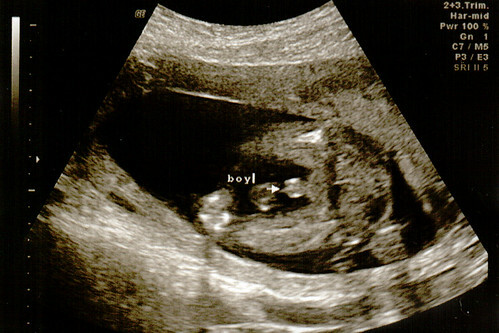 Our little boy(!) is 10 ounces so far and doing fine. It was a treat to get to show my parents how the ultrasound equipment works and have them see their grandson in utero. On the way to the doctor's office, Rich was driving but he doesn't go downtown that often so I was literally being that backseat driver telling him where to turn and reminding him which lane was about to become right turn only. I told my mother that we would have to practice this route so that he had it memorized before the baby is due and we're rushing to do it in the middle of the night. When my mother went into labor with me my father wanted her to wait until after midnight to go to the hospital so they wouldn't get charged for the previous evening. As they drove to the hospital just after midnight on May 20th, my father was on automatic pilot (and probably reduced sleep) and accidentally got on the interstate versus the turn for Thole Street that lead to the hospital. It took them an extra little bit and some panicked "where are you going?!" remarks from my mother for them to get to the hospital. Only a few hours later, I was born. We've never made big deals about birthdays in our family. Rich and I are going out for sushi tonight and then I'll maybe do some sewing this evening. I took the day off to not be rushed for the appointment, get my nails done this afternoon and rest up a bit before the weekend. All in all, not that different from other days except for the whole window into my womb thing this morning. But I did get a nice gift from Smashing Magazine in that they published their article today about promotional materials that features a picture of my bottle openers I made last year for BlogHer (the picture is way towards the bottom but it's a good read so keep scrolling). I think that and some fresh baked brownies this evening are all I could ask for. And in the interest of embarrassing our son before he's even born, feel free to gawk at him while he's still in my ever-expanding belly. P.S. While in the waiting room for the ultrasound, my father leaned over and told me the woman around the corner had a "Baby Phat" t-shirt on and he thought it was some sort of maternity line of clothing. I couldn't muster explaining "phat" to my father before 9am.